SPARK IS GOING TO peru! Wake up to beautiful mountain views nestled in the majestic Sacred Valley of the Incas and in a forest of clouds next to the Urubamba River. Renew your daily yoga practice in this ethereal environment and feed your appetite for adventure with ancient sightseeing and expedition hiking. The harmonious mixture of old and new will soothe the soul on a deep level. Our itinerary is carefully curated with altitude changes in mind and packed with day tours and all the must-see, must-explore places. There will be a lot of walking and hiking including uneven steps and altitude changes. Be prepared for a physically demanding, but rewarding adventure! The 2-day non-camping hike to Machu Picchu, one of the Seven Wonders of the World, will give you both sunrise and sunset views. The hike includes visits to Incan site Wiñay Wayna (Forever Young), Sungate with panoramic view of Machu Picchu, and Huayna Picchu climb (the iconic mountain behind many Machu Picchu pictures). All the hand-picked accommodations are Peruvian owned institutions. All scheduled day trips are private tours. 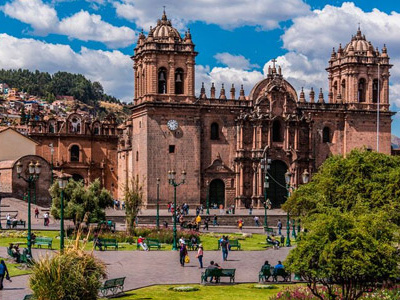 We have created an itinerary that supports and gives back to sustainable Andean communities. Our Machu Picchu tour operator is the only one in the region to hire women porters for the Inca Trail in addition to providing proper food, sleeping pads, camping tents for their staff. Wednesday: Sound Bath - get centered before the big hike! This bio-constructed retreat center is surrounded by native plants. The rooms are inspired by the seven chakras. >> Arriving in the Sacred Valley straight away will help you acclimate to the high elevation. > Market Day! Visit the Pisac Market when all the neighboring communities come together. Get ready to shop or just grab a snack at one of the local stalls. >> There are many optional activities for you to choose, but we recommend that you take the majority of time to relax, meditate, and prepare for the upcoming MP hike. 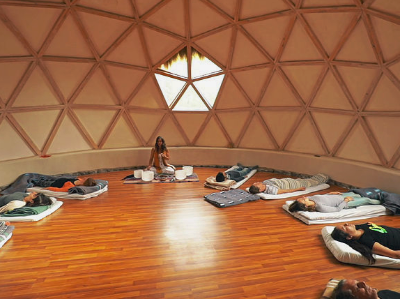 > Sound Bath to get centered for the big hike! >> Must-sees. Ollantayambo: is an ancient fortress and temple of the sun. 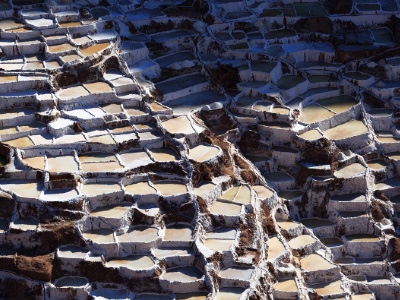 Maras: These salt pools on the hillside date back to ancient Incan times. Moray: This unique archeological site contains several terraced circular depressions. >> Optional: Temezacal (Andean Sweat Lodge): We recommend doing this on Day 4 so that you can recharge before the Machu Picchu hike. Other optional activities include Standup Paddleboarding in Huaypo Lagoon, a Flower/Plant Bath, or Mountain Biking. > Machu Picchu (MP) Day! > Private Guided Tour of Machu Picchu + Huayna Picchu climb included! > Time for a selfie! You earned it. >> The upgraded Vistadome train will give you full views of landscapes and vistas on the way to Machu Picchu. >> Bottled water or fresh boiled water will be made available throughout the trip. Double/Triple bed options for Mandala Sacred Valley. All other accommodations are double beds. All beds are first come, first served. Laws for Machu Picchu entrance have changed since 2017. 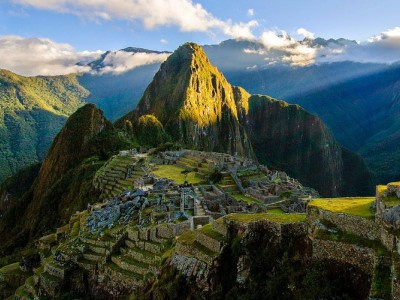 Only a limited number of permits are released for Machu Picchu and Huayna Picchu each day. Make sure your passport is current when booking. You will need it to secure your Machu Picchu permit and train ticket. May to October is dry season in Peru with sunny days, bright blue skies, and chilly nights. August is a mid-winter with temperature ranging from mid-60’sF during the day to a colder 35F at night. Bring layers!! > Although most meals are included, we want to leave room for adventure and spontaneity. Meals that are not listed are not included. > Rainbow Mountain is optional, because the elevation is > 17,000’. Choice of insurance carrier and plans are completely your decision to make. Take me to the land of llamas! This Retreat Page lists what is included in the price of the retreat. Payment may be made by credit card only. Full payment is due at the time of booking to reserve a room. Payments are non refundable and non transferable. Travel Insurance is required in the event of an emergency. SPARK YOGA reserves the right to make any changes deemed necessary by our team, trip leaders, teachers or partners. In the rare case of a cancellation on the part of SPARK YOGA we will offer a full refund of your original payment. SPARK YOGA is not responsible for any expenses or damages incurred as a result of trip cancellation including preparation costs, airline tickets, travel documents or other expenses. SPARK YOGA reserves the right to cancel any trip prior to departure in the event that there are too few people booked, in which case you will be given a full refund of any and all payments made to SPARK YOGA. You will not be entitled to claim any additional amounts or seek any compensation for any injury, loss, expenses or damage (either direct or consequential) or for any loss of time or inconvenience which may result from such cancellation (including but not limited to visa, passport and vaccination charges, gear purchases, and airport and airline taxes). SPARK YOGA requires each trip member to purchase individual travel insurance for their trip. We suggest that you include "cancel for any reason" with your policy. You must purchase travel insurance that includes medical coverage. It is the responsibility of each traveler to obtain all required travel documents including Visas and other travel documents unless otherwise noted. It is your responsibility to purchase correct immunizations. Please contact your nearest travel clinic for the latest requirements. Although every attempt is made to complete the listed itinerary, it is subject to change. There might be slight variations due to weather conditions.